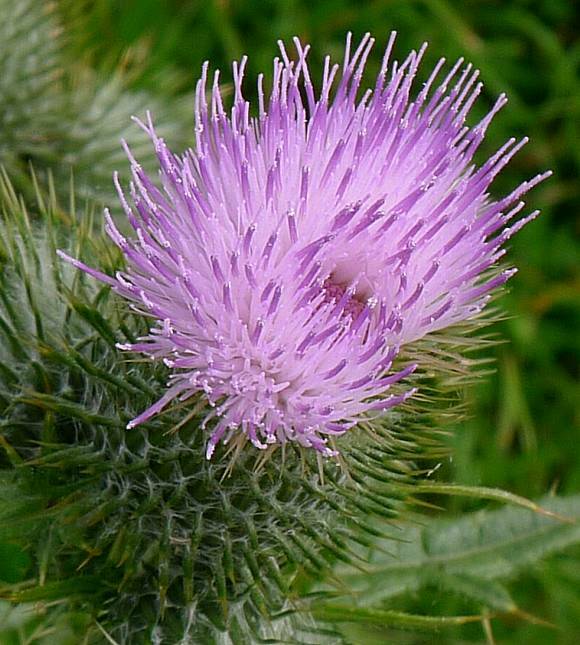 The commonest thistle with large flowers. Tall, stout, many branched and sometimes shrubby. 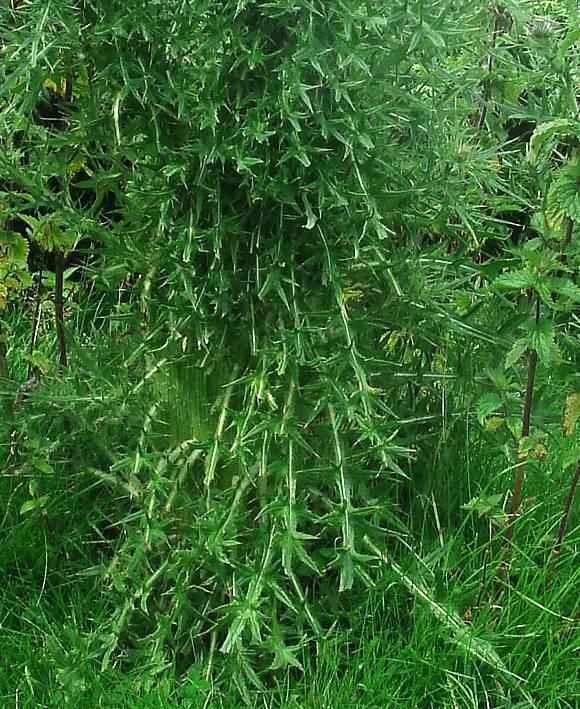 Can grow to 1.5m high. 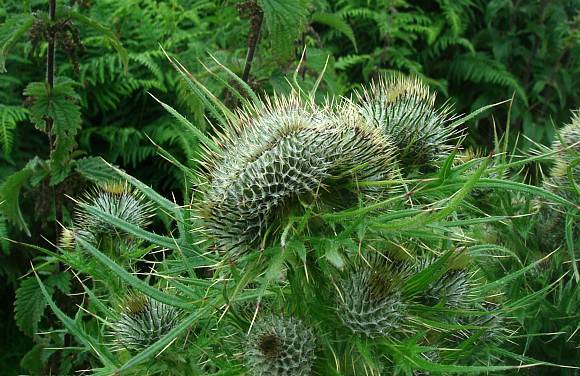 Has spear-shaped leaves with spear-shaped pinnate lobes, each point with a yellow tipped sharp spine. Large globular flower-heads covered in sharp spines. 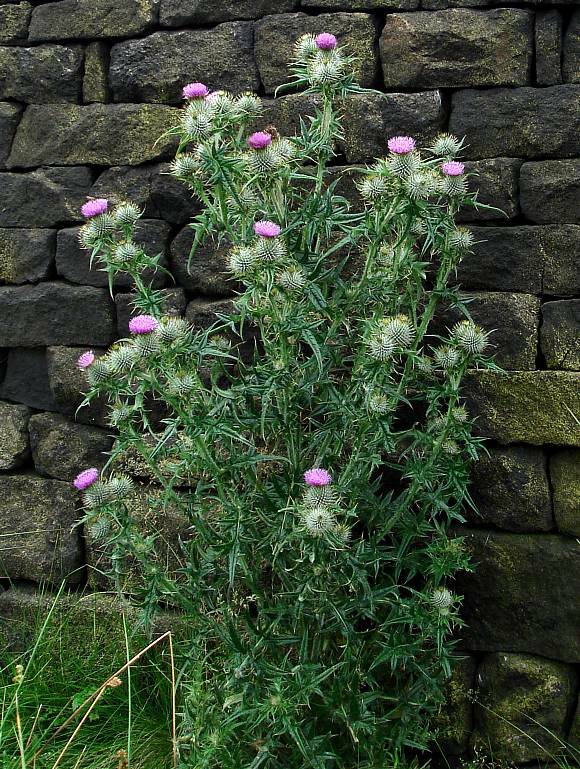 Most flowers are in singles atop a stem. This specimen is thinner and more branched, possibly as a result of mechanical damage when growing. Some specimens have flowerheads that are more egg-shaped rather than almost spherical. 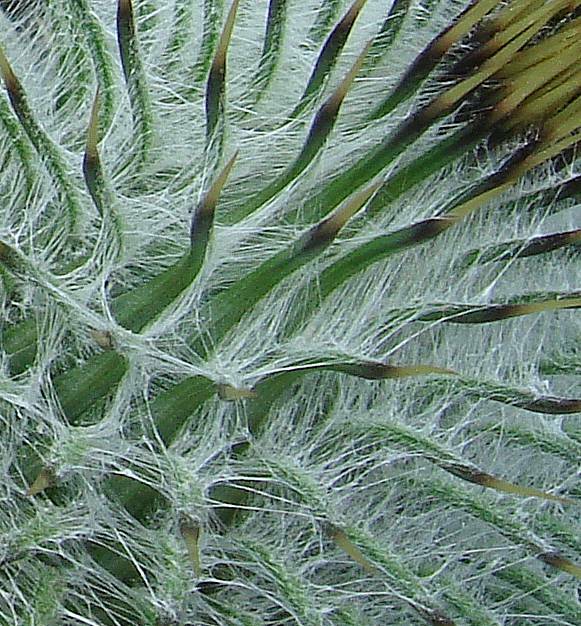 The top of the flower has at first a larger density of vertical yellow spines (right) where later on a purple plume of disc florets erupts. 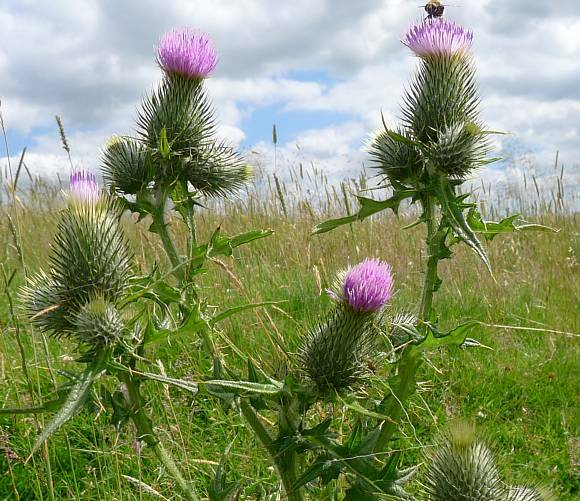 There are no ray florets on thistles. A well developed head of purple/mauve disc florets atop an almost spherical globe of thin green bracts tipped with sharp yellow spines. The disc florets from above. Right in the centre some have yet to open. 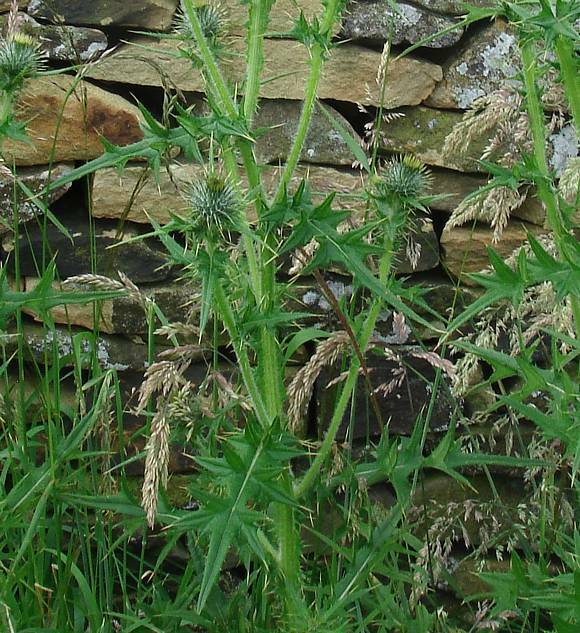 Between the narrow bracts is a network of woolly threads. 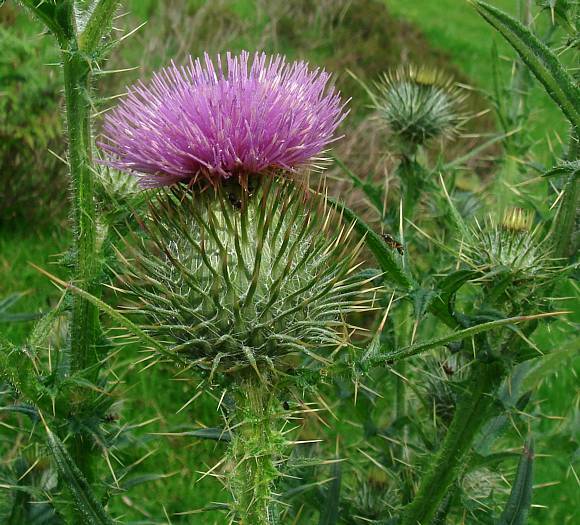 Un-like Woolly Thistle, the network is sparse enough to be able to see through. 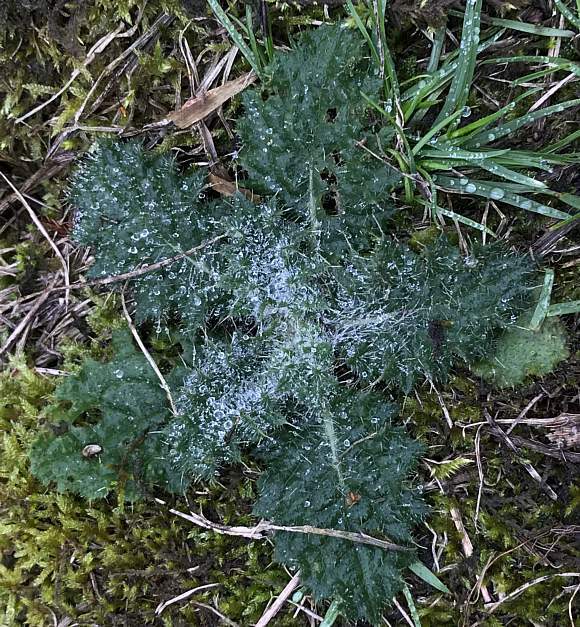 An unusual specimen with a greater cobweb density than most, but it was on the same plant as the more normal specimen above. 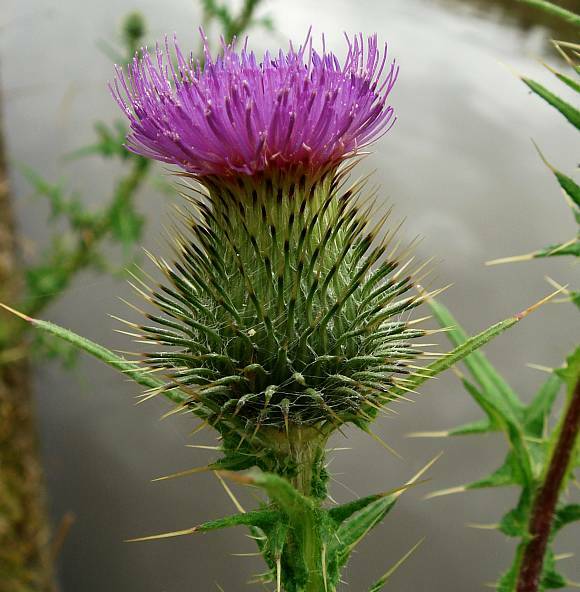 (If this was the hybrid between Spear Thistle and Woolly Thistle, then the spines should be red tipped, rather than yellow). 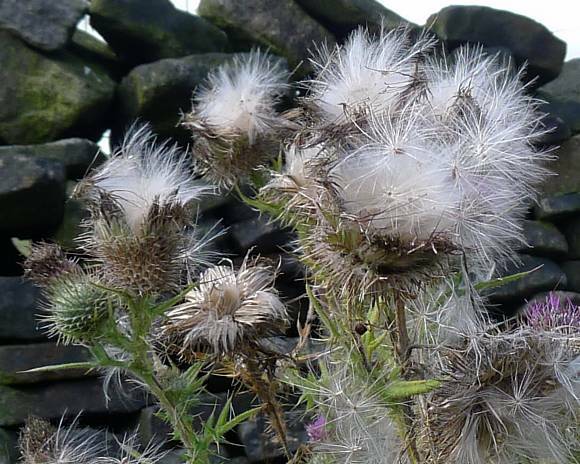 A somewhat weather-beaten seed clock of feathered seeds, or pappus. 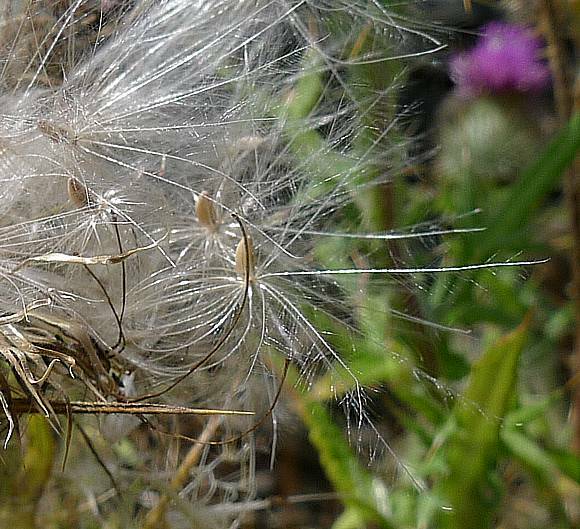 Seeds attached to their feathery parachutes or pappus. 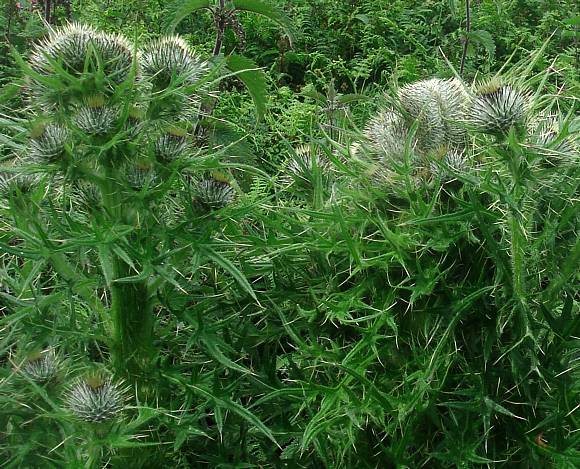 These have been blown about and re-caught by the thistle itself. 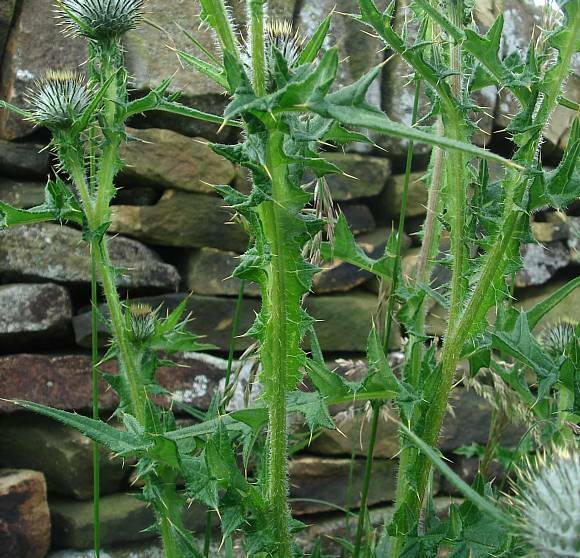 Spear-shaped leaves with extremely sharp spine-tipped wings. 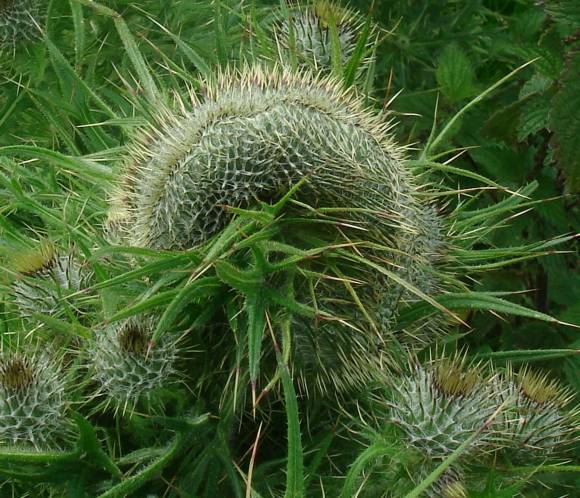 The stems are winged and equipped with sharp yellow-tipped spines. This specimen has longer white hairs than seems to be normal. Notice that, by transmitted light, it is possible to see that the spines on the wings actually come from within the stem and branch several times before emerging on the edge of the wing as spines. 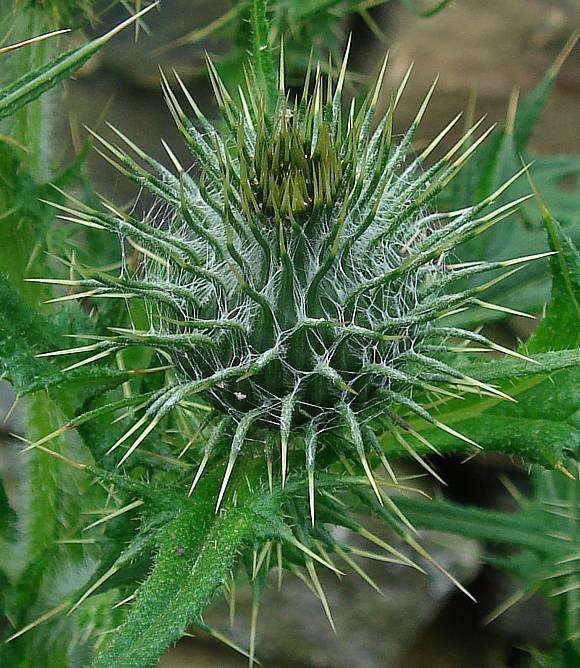 The same seems to be true of the more robust spines in the leaves also. The basal rosette of leaves. A very yound basal rosette of leaves just 3 inches across and covered in raindrops that were too painful to brush aside with the fingers: those very thin spines are very sharp! [Fasciated example]. This example has several flower heads that are fasciated, i.e. have extended growing centres. It is a genetic aberration. The density of leaves is also much higher than is normal. [Fasciated example]. Mixed in with normal flowers on the same plant, many others flowers are semi-toroidal rather than globular. [Fasciated example] Here two fasciated flower heads are growing parallel to each other; the two yellow-green stripes down the outside middle are where the purple disc florets will eventually emerge. [Fasciated example] Side-on the hemi-toroidal nature is seen more clearly. As such, it resembles one of those old toilet brushes made of twisted stranded heavy-gauge wire with bristles sticking out either side. The fasciated flowers are growing amidst normal flowers on the same plant. [Fasciated example] The single stem is hidden behind an abnormally high density of spear-shaped leaves. 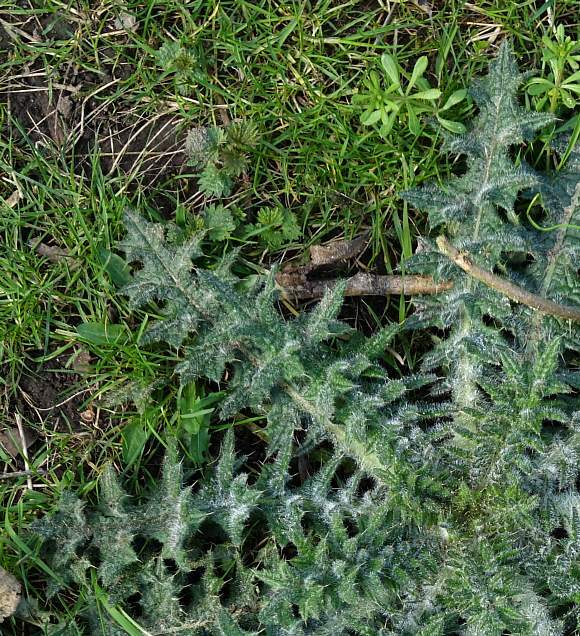 See Dandelion for information about fasciation. 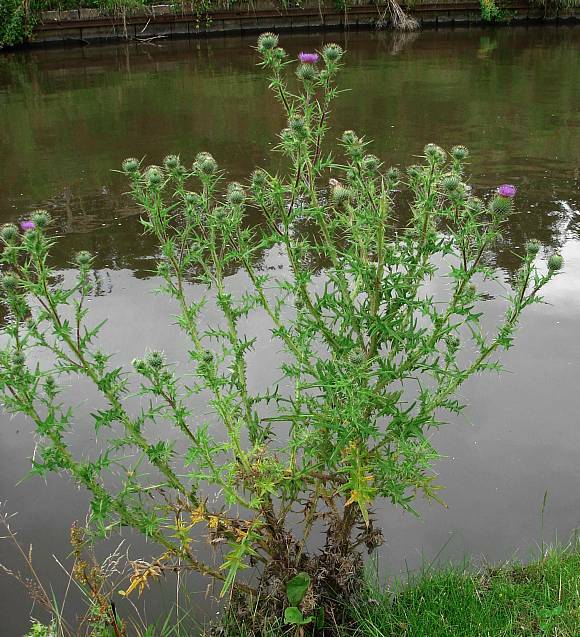 Dwarf Thistle (Cirsium acaule) to produce Cirsium × sabaudum . But none of these hybrids occur frequently, in fact they rarely occur at all anywhere. 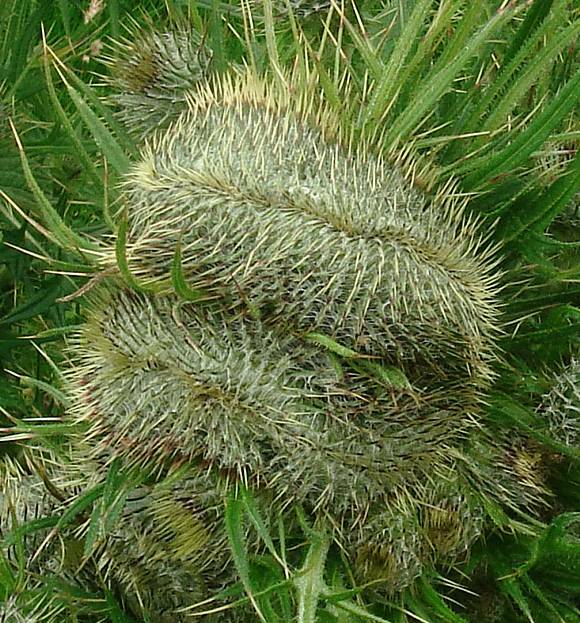 Some similarities to : Woolly Thistle but that has wingless stems, the density of wool in flower-head is so high as to obscure anything between the spines that are barely able to peek out, and all the spines are red tipped (rather than yellow). Also, the leaves have forwardly directed triangular side-lobes (rather than forwardly and backwardly directed triangulare side lobes). Distinguishing Feature : The yellow-tipped spines and the large, almost globular heads that have a few white threads in, (but not as many as to obscure the innards). 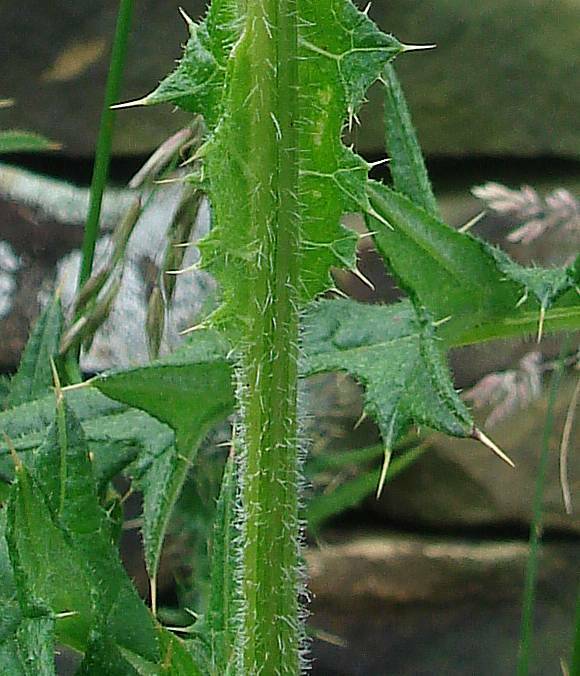 Your author surmises that the web of cottony threads between the wiry green bracts on the flower head forms akin to chewing gum: with a semi-viscous liquid between them at first, as the bracts grow and part, the liquid is stretched and then surface tension dictates that it forms threads between parting bracts, which must then either dry or polymerise or oxidise into the threads seen, much as does glue when two coated surfaces are parted. The cells formed seem to be square, and moreover no threads between diametrically opposite bracts seem to form, meaning those bracts were never touching each other. 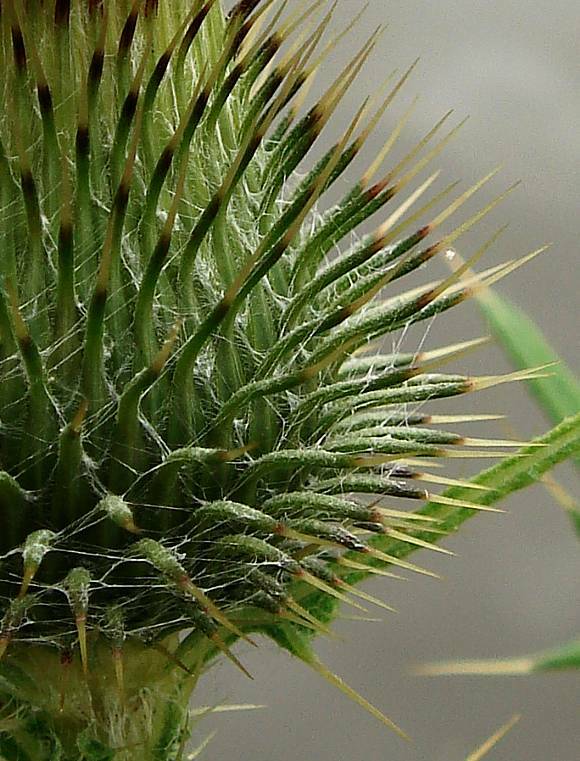 It is possible the bracts themselves exude the semi-liquid. The Author does not know if his theory is correct, but it seems logical. 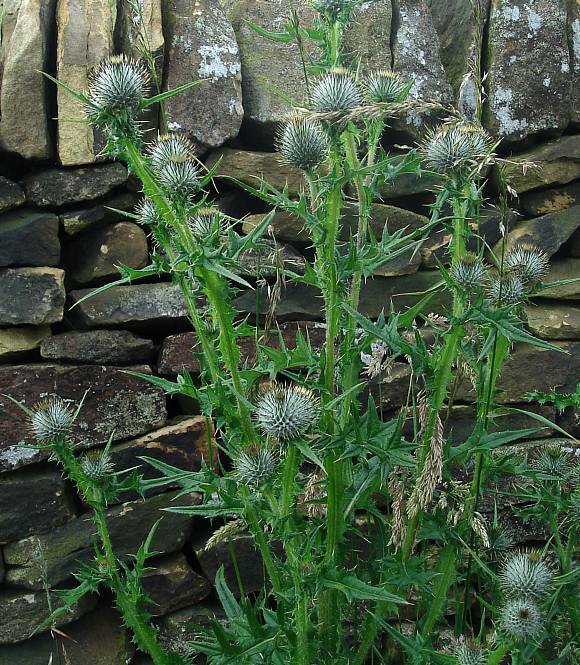 Woolly Thistles, Globe-Thistle s and Cobweb Houseleeks also have networks of woolly threads between an array of bracts.